As we reach the end of our Seeing Illegal Immigrants project, Christina reflects on a rewarding 24 months, and offers her thoughts on coordinating comparative research. And so the project is nearing its end. Our research group is preparing to disband and our dedicated postdocs will go their separate ways. Elisabeth will move to Goettingen, where she is taking up a Post-doctoral fellowship at the Max Planck Institute. Sara will go to Paris, where she begins a research role in a newly-established research centre. And Mike decamps to Lincoln, where he took up a permanent lectureship in the Spring. These are really excellent career moves for each of the post-doctoral research fellows. The project included a number of firsts for me. I’d done plenty of work comparing Germany and the UK, but the inclusion of France as a third country study added a fresh new perspective. Even more importantly, it was the first time I’d worked closely with a historian and included a historical dimension, which involved working with archives. Both the historical and French aspects were made possible by the collaboration with Emile, and it’s been hugely rewarding working with him. This was also the most compressed project I’ve led, lasting just 2 years – which was especially challenging given the broad corpus of data we needed to collect. We barely got a chance to pause for breath, and we are only just beginning to make sense of the data and develop ideas for publications. Thankfully, although the team is moving on, we are all committed to co-operating through a range of papers and a planned book. So while it’s fresh in my mind, I thought I’d list a few things I’ve learned from the research process. 1. Good cross-national comparison requires really careful coordination. Many of us will have had experience of more loosely coordinated cross-European comparisons, where different national teams take charge of each case study. These project structures may produce excellent data for each country – but they rarely produce truly comparable data and analysis. We sought to avoid this by having a closely integrated group of post-doctoral fellows, co-located for most of the project, and coordinating regularly while away on field work. So we were able to develop a common understanding of the key concepts, theories and variables being employed – which guided which data to collect, and how to code it. That all worked pretty well. 2. It was challenging to ‘outsource’ archival data collection, however. Unlike with other forms of data typically deployed by political scientists – interviews, document analysis, quants data on political behaviour – it can be extremely laborious to wade through. So while delegating data collection to team members may save labour initially (and indeed may be necessary if the PI faces travel constraints), it’s far from straightforward to access and make use of thousands of pages of bureaucratic communications once they’ve been collected. Thus far, I have been able to read a fair bit of the UK archival material, but have found it more daunting to approach the French and German material. This makes systematic coding really crucial. Co-authorship is also important, allowing the colleagues who collected the data to team up with the project leaders to jointly analyse the data. We will get there, and it’s certainly worth the effort, but it has not been straightforward. 3. Having said that, I am a true convert to archival data. I’ve found it fascinating to trace the evolution (if we can call it that) of policies on irregular migration from the 1960s onwards. I’m convinced this historical perspective is a really important lens through which to understand public policy – not just for the obvious historical institutionalist reasons (in which past decisions shape and constrain current ones). But also because it is interesting to understand how particular social problems were initially identified and constructed – which provides very interesting insights into theories of problem construction. And there’s nothing like archival data to get insight into the detailed deliberations of officials and ministers. So this rich historical data can really contribute to theory-building. 4. It’s important to be flexible with the research design – but consistent across the cases. We found that we simply didn’t have the capacity to cover the period from the early 1990s to the present day, as set out in the proposal. So we decided to focus on a ‘critical juncture’ in immigration control, occurring roughly from the late 1980s until the early 2000s. We decided on this collectively, through a scoping of each country case to see which the most interesting period was to zoom in on. We will treat more recent developments as a sort of epilogue to our analysis. I am really glad we decided this, as we have gained a really rich understanding of the two periods we focus on indepth. This wouldn’t have been possible if we’d stretched ourselves too thin. 5. We always knew it would be a challenge to compare archival data (for the 1960s/70s) with interview data for the more recent period. Interviews necessarily involve a degree of post-facto sense-making, and many of our interviewees were talking about events long passed. So the data simply cannot reproduce government thinking as meticulously as the written records. But tapping the recollections of retired officials turned out to yield very rich material – interviewees could be more frank, and had had time to process and contextualise their experiences. Of course, it would be difficult to compare this data with the archival material in a rigorous comparative research design – but we have more than enough material to reconstruct the content and nature of deliberations over the two periods, and to compare across the national cases. 6. We have also had to be flexible about our publication plans. As we analyse data, we develop different ideas about how we can contribute to different literatures – and what sorts of comparisons will be fruitful. I initially had an idea of doing a 3-way comparison of how the social ‘problem’ of irregular migration first emerged – but then got bogged down in the UK case and discovered there was a paper in that alone. By contrast, a UK/German comparison of ‘political ignorance’ works brilliantly as a way of illustrating ideas on ignorance I’ve been developing for a long time. Elisabeth, Mike and Sara have found interesting parallels in how the three states prioritised access to welfare as a site for controlling irregular migration, and so are now working on a paper on that. There is plenty more scope for different comparisons and single country papers. We have encouraged the team to be entrepreneurial in how they identify and develop different formats of comparative or single-case analyses. Though of course, our planned book will offer us a more accommodating format for a thorough comparison of the three cases. Our guiding principle throughout, it should go without saying, has been that authorship arrangements need to mirror the respective contributions to analysis and drafting. 7. Clearly, ongoing dialogue among the team members was absolutely crucial. We had an intense phase of discussion at the beginning, to make sure our understanding of the research questions, concepts, theories and design was well aligned. Once the researchers were in the archival ‘field’, they posted weekly reports, and we had frequent group Skype chats. We continued our regular meetings to agree on data coding, planning the interviews, and developing publication plans, over the second year of the project. And the project culminated in a writing retreat, where we had concentrated time to work on outputs and to discuss our findings and insights. 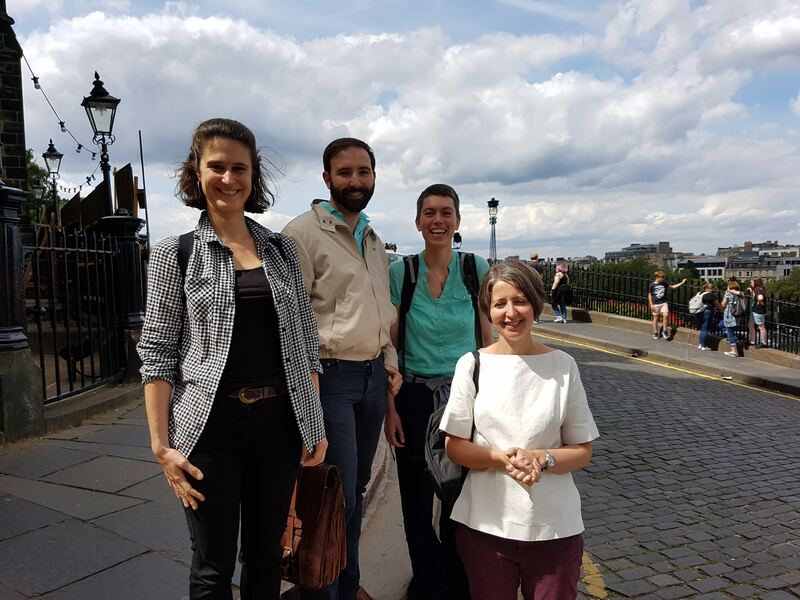 Elisabeth, Mike and Sara also had their own ongoing discussion, co-located in the same office and continually sharing ideas and advice – from comparing key concepts across the cases, to sorting out glitches with NVivo. Luckily we all got on very well – and have firm plans to keep the conversation going. We will be meeting next July in Paris for a follow-up writing retreat, at which point we should be finalising outputs from the project. Until then, all that remains to be said is… a bientot, bis bald, and see you soon!